Puerto Vallarta, Mexico - Garbage is an ongoing problem in tourist destinations, and Puerto Vallarta is no exception. We all need to do our part to keep our rivers, beaches and neighborhoods clean, and when we do, it makes life far more pleasant for everyone. Last Summer, The JG Group started a monthly Community Clean-Up in Colonia Emiliano Zapata in an effort to raise environmental awareness and to get residents and visitors alike involved in keeping our beautiful city clean. 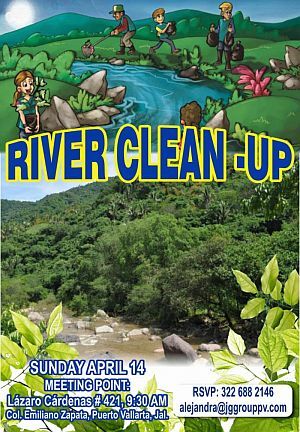 In our continuing efforts to contribute to the conservation of our natural environment, we are organizing a River Clean-Up along the banks of the Rio Cuale on Sunday, April 14 at 9:30 am. If you love Puerto Vallarta, and are going to be in town this weekend, make plans now to join us and share the love. If you decide to join us for an especially gratifying morning, please RSVP to alejandra(at)jggrouppv.com, and plan on being at The JG Group office in Colonia Emiliano Zapata on Sunday, April 14 at 9 am. We'll start the day with a complimentary continental breakfast to fuel some energy for the clean-up, which starts at 9:30 am. The JG Group will supply the garbage bags and tongs. You bring your positive energy. Together we can make a difference! If you cannot participate, but would like to contribute to the clean-up effort, you can donate $100 pesos so we can hire some local kids for the clean-up. Please swing by our offices anytime between 9 am and 6 pm during the week and we'll be happy to take your pesos!